Equinox, originally uploaded by The Bacher Family. On the evening of the Spring Equinox, I felt a strange and inexorable urge to go outside and photograph flowers! 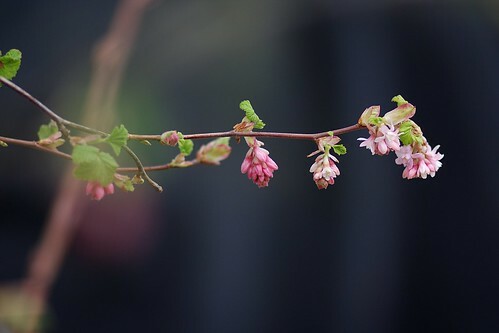 Our home is landscaped with native plants, so my targets were high bush Oregon grape, mock orange, and, in this case, red flowering currant, one of my favorite spring flowers. I used an 85mm prime lens to achieve shallow depth of field. I'm really pleased with how well lit this image is; the lighting was overcast, but with the dark background the pink flowers really "pop," and the highlights on the branch are nice too. Direct sunlight would probably have burned out the highlights completely.